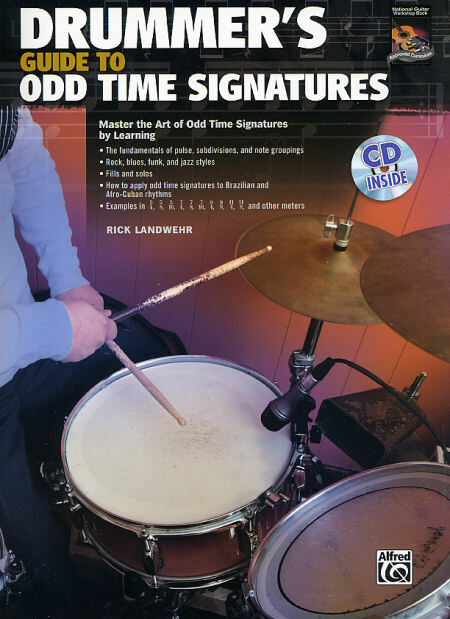 Tiger Bill Reviews Drummers Guide to Odd Time Signatures Book and CD by Rick Landwehr from Alfred Publishing and National Guitar Workshop. Back in the 1950s and 1960s Odd Time Signatures were, well, odd! They weren't nearly as commonly used as they are today. Dave Brubeck, with Joe Morello on drums, was one of the first artists to really make odd time signatures popular with songs like "Take Five" (in 5/4) and "Blue Rondo a la Turk" (in 9/8). Today I have a student (Mikey Manasseh) who has been playing "Blue Rondo" to perfection since he was 8 years old! Even as common as Odd Time Signatures have become, there are still many drummers who have trouble playing them and stand to lose a great deal of work because of it. If you don't feel as comfortable playing in Odd Times as you should, this book and CD can help. Let's check it out. Notation Review: Explains some basic music theory including note values, dotted notes, time signatures, swing versus straight notes, etc. Building Blocks: Discusses the terms pulse, subdivisions, and note groupings, which are all commonly used throughout the book. 3/4 and 6/8 Review: Covers Rock, Funk, and Jazz grooves in 3/4 and basic 6/8 grooves. Time Playing in Five: Rock, Funk, and Jazz grooves in 5/4 time including hi-hat and cymbal variations. 5/8 and 5/16 is also covered. Time Playing in Seven: Features Rock, Funk, and Jazz grooves in 7/4 and includes 7/8 and 7/16 times. Time Playing in Nine, Eleven, and Other Odd Time Signatures: Features Rock, Funk, and Jazz in 9/4. Includes 9/8, 11/4, and 11/8 time signatures. Applying Odd Time Signatures to Brazilian Rhythms: Covers 3/4, 5/4, 7/4, 5/8, 7/8, and 11/8 Samba styles along with Bossa Nova in 5/4 and 7/4 time. Applying Odd Time Signatures to Afro-Cuban Rhythms: Includes Mambo in 7/4 and Songo in 5/4, 7/4, and 9/4. Playing Fills in Odd Time Signatures: Covers various length fills in 5/4, 7/4, 5/8, and 7/8 . Conclusion: Includes recommended Audio CDs featuring Odd Times to study including Progressive Rock, Jazz, World Music, and World Fusion Music styles. If you're not as comfortable as you'd like to be when playing Odd Time Signatures, this book and CD will go along way to helping you get in the Odd Time groove. A bonus is the included Audio CD that contains examples of 99 of the exercises in the book, which will be a great help to those who have trouble reading the written notation.